It’s the week of Valentine’s Day, which means that there are tons of amazing, decadent, extravagant desserts popping up on blogs this week. Since I knew my blogging buddies would have the exquisitely fancy desserts covered, I decided to go the opposite route and share a simple, quick, + completely unfussy (but still delicious!) 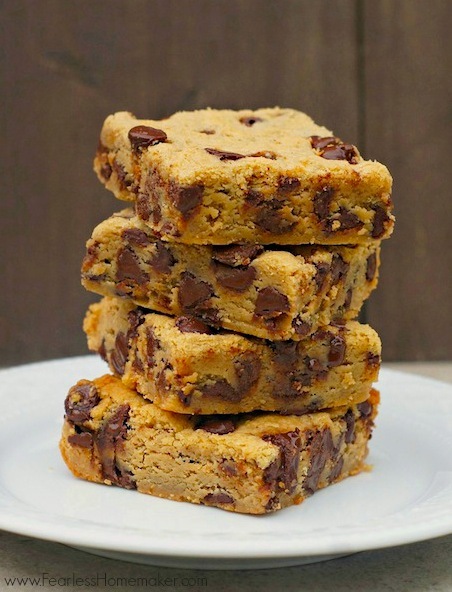 dessert with y’all – these Peanut Butter Chocolate Chip Bars. Preheat the oven to 350 degrees F. Line an 8×8″ baking dish with aluminum foil or parchment paper, leaving a slight overhang for easy removal. Spray with cooking spray + set aside. In a large bowl, combine the melted butter, peanut butter, brown sugar, vanilla extract, and egg. Whisk together until well-combined and smooth. Add in the flour and stir until just combined – do not overmix. Then, stir in the 1 cup chocolate chips. Turn the batter out into the prepared baking dish, smoothing the top lightly with a spatula. Top evenly with the remaining 2 tablespoons chocolate chips. Bake for 20-25 minutes, until the top is golden, and a toothpick inserted into the center comes out clean. Allow bars to cool in pan for at least 30 minutes before using the aluminum foil/parchment overhang to transfer to a cutting board. Cut into 9, 12, or 16 bars, depending on how big you want them to be. Bars will keep up to 1 week at room temperature in an airtight container. I always appreciate simple and quick. When I have a fierce craving, the word “wait” is unacceptable. Pinned. Sometimes the simple things are the best when it comes to winning hearts. I’m sold. Peanut butter and chocolate are a great combination. How great that your little girl helped you! Real yum! I am literally licking my laptop screen at the moment omomomo :D!! I think some of the simple desserts are the most satisfying. You cannot go wrong with peanut butter and chocolate. 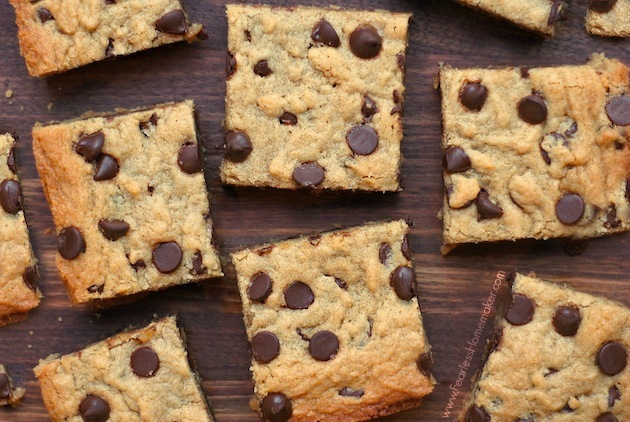 I looove peanut butter chocolate chip bars, and yours look perfectly ooey gooey delicious! These are perfect – my boys would love this recipe! he’ll go crazy for this recipe. These bars looks so good! You can’t beat chocolate + peanut butter! Yum!! Chocolate and pnut butter is pretty much the best combo ever! And these look so dense and peanut buttery. Perfect for V-Day! Unfussy sounds very good to me. I bet these are delicious. They are the kind of treat that really hits the spot at around 3:oo pm. I hope you had a wonderful Valentine’s Day!